Time for a review of classical CDs that were outstanding in 2011. My lists for the previous years: 2010, 2009, (2009 – “Almost”), 2008, (2008 - "Almost") 2007, 2006, 2005, 2004. 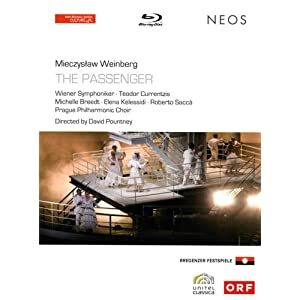 I had tickets to Weinberg’s “The Passenger” (♀) in Bregenz, but something or other got in the way and I had to cancel. What a missed opportunity. It’s almost hard to say whether the recording of the production (NEOS) alleviates the regret, or heightens it – because everything: the work, the production (directed by David Pountney), the performance, and the transfer onto DVD/BluRay is terrific. In 1960 two passengers recognize each other on an ocean liner to Brazil: Lisa – who was a guard at Auschwitz, now the wife of a West German diplomat – and Martha, who was under a polish inmate under Lisa’s direct jurisdiction. Flashbacks and Lisa’s attempts (with her husband) to deal with her past and the impossible moral schism that results from it lead the viewer through eight scenes and an epilog in two acts. Librettist Alexander Medvedev’s invention of Tadeusz, the musician-fiancé of Lisa, who fatally plays Bach’s Chaconne (which strikingly moves and morphs from soloist to orchestra to chorus) instead of the concentration camp commandant’s favorite waltz, introduces music ‘naturally’ into the opera. Beyond brimstone, drama and harrowing bits, there are moments of radiant Britten-esque beauty and calm in the multi-lingual (German-English-Polish) Passenger; climaxes that could be found in Prokofiev, and admittedly brittle stretches. The Prague Philharmonic Choir and the Vienna Symphony Orchestra under Teodor Currentzis are worth singling out; ditto Michelle Breedt, who sings the part of Lisa. (Interview with her about that character here.) Production values are great throughout, except for the Chia-Pet-like shorn-hair ‘wigs’ that make the inmates look like cartoon hedgehogs in the close-ups… one of the snags of the superb picture quality of the BluRay. It comes with an exemplary booklet that includes a synopsis, Shostakovich’s text in full, and the libretto in four languages (English, German, French, and Polish). The DVD is out in Europe, and when the distributor Qualiton gets its act together, also in the US, soon. 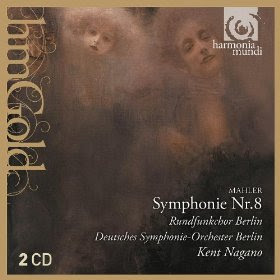 With mystery and sensuality second only to Seiji Ozawa (Philips), Nagano offers that sound from other spheres that few, if any, other Mahler Eighths (recent, live, or otherwise) achieve. The prominent organ in Nagano is a much appreciated touch, too. At 88 minutes (the time it takes him for the second movement is well spent!) it comes on two CDs, which made the—unfathomably short-lived—original release pricey compared to its rivals. In the lower priced hmGold re-release, that’s no longer an issue and the Mahler-addict can be glad to have one of the finest Eighths back in the catalog.